Everyone knows about my love for a good old-fashioned Coca-Cola. Even my dentist. So when someone asked if I ever typed in all the little codes under the caps of the bottles I buy at the corner store, I didn’t have a good excuse. The My Coke Rewards program is hyped on nearly every version of the product. But I guess I was too busy trying to find a can with my name on it to pay attention to my rewards earning potential. 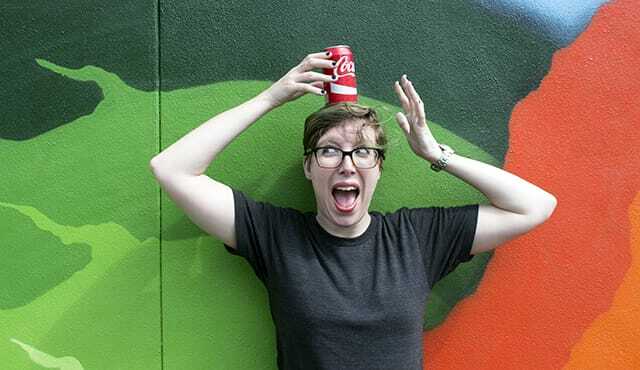 Before I joined, essentially revealing my low-level caffeine addiction to the company, I decided to check out whether it’s really worth it to sign up for My Coke Rewards. If you’ve ever looked under the cap of a Coke bottle or inside a cardboard box of cans, you might have noticed a 14-character code. Each Coke product has a different points value that accrues in your My Coke Rewards account as you add codes. Smaller products, like a 20 oz. bottle or a two-liter bottle, are typically worth three points each. As products get larger, you earn more points. A 12-pack of Coke cans earns 10 points, and if you can find a 30-pack, you’ll land 25 points. The program also includes brands you might not realize are a part of Coca-Cola — which means more ways to earn. TaB, Powerade, Mello Yello and Fresca are all eligible, as are club soda, seltzer, tonic and the rest of the Seagram’s lineup. Minute Maid juice is in, as are Dasani bottled water products. Once you accrue as few as 170 points, you can redeem them for swag or gift cards. Getting points is cool, but earning “Status” helps you level up in your Rewards game even faster. By participating in My Coke Rewards activities based on your interest — ranging widely from health and fitness to gaming — you can typically earn one to three points points each. Tasks include participating in a Twitter conversation using a specific hashtag or voting in a poll. The more Status, the more diverse rewards you can access. You don’t get Silver or Gold Status just by earning points, however — you’ve got to be willing to participate in activities and share that participation with your social media networks. So if you’re Facebook friends with your dentist, you might not want to share anything about your soda habit. Everyone starts at Bronze level when they sign up for My Coke Rewards. But there’s not a huge increase in the variety of prizes once you hit Silver or Gold level. And if you don’t participate in any activities on the site for 30 days, your status reverts to a lower level. So How Much Coke Do You Have to Drink to Earn Rewards? If you only drink soda once in a blue moon and you’re always carrying around your own water bottle, you should probably just stop reading right here. You have to purchase a serious amount of Coca-Cola products to get anything good. I’ve admitted my deep, deep love for Coke, but what I didn’t mention before was my amazing self-control. I do my best to save a crisp can of Coke for an occasional treat. I know, what a role model. So I did a little math to see how much Coca-Cola I’d have to purchase in order to earn rewards. Say, for example, I let myself buy one 20 oz. bottle of regular Coke per week, for a total of 52 bottles per year at three points apiece. If I enter every single 14-character code I get, I’ll earn 156 points by the end of the year. What can I do with them? I’d get there after enjoying 119 20-oz. Coca-Cola bottles. After 236 20-oz. Coca-Cola bottles, I could buy maybe six pairs of socks at Marshalls. I’ll earn a free book after slurping down 56 20-oz. Cokes, but shipping isn’t included. I’d have to drink 583 20 oz Coca-Cola bottles to earn enough points to get running shorts from Nike. At that point, I’m really going to need new running gear because I’ll have puffed up a bit from all the sugar. Let’s say I let my habit get the better of me, and I buy 104 12-packs of Coke cans each year (two 12-packs per week). A 12-pack is worth 10 points, so I’d earn 1040 points over the year. At that rate, I can get one $10 gift card to a retailer like the Nike Store or Marshalls. Or, I could get two $5 credits to iTunes. Is that even enough to buy a whole album? And in both cases, I have points left over that are almost good for something, but not quite. I could spring for a photo book, but only if I want to pay shipping. If I really want to use my points, I can use them in onesies and twosies on sweepstakes and instant win games. If I win, I might get a $5,000 Visa gift card, or a huge LED TV. If I lose — let’s face it, I’m probably going to lose — then it’s goodbye, points. Verdict: If you’re going to earn any big rewards from this program, your caffeine habit is going to have to be a lot more serious than mine. There’s one clear situation where it makes sense to participate in My Coke Rewards: If you’re buying supplies or groceries for your office. If you have a huge office fridge, like we do here at The Penny Hoarder HQ, you know there’s someone tasked with going to Costco on the regular to stock it with beverages. If the designated supply buyer enters in the points from all those cases of soda and seltzer, the earned points could go toward gift cards for the fine folks you work with. Give them away for employee birthdays, or have fun competitions and use the My Coke Rewards gift cards as prizes. You can also donate your points to organizations like the National Park Foundation, the USO or St. Jude Children’s Research Hospital. But don’t expect those donations to go too far. Donating 35 points to the National Park Foundation is valued at $0.525 — basically 53 cents. You can also donate your points to a school of your choice. Your points get converted to cash so your local school can use the funds to buy books or whatever else it might need. Your Turn: Have you tried My Coke Rewards? How did you maximize your earning power?